Congratulations on taking an step in your special relationship where love, passion and lifelong commitment reside, you are ready to move to one of the most exciting periods in your life – being engaged to the chosen one, the one you are going to spend the rest of your life with. While not many jewellers are selling platinum, Shimansky is world renowned for their platinum jewellery and especially their platinum engagement rings. With over two decades of platinum jewellery crafting experience, we can highly recommend platinum as the perfect choice for your engagement ring. When the time comes to have your dream engagement ring made and choosing nature’s most precise gem – a diamond, remember that platinum is the perfect metal to hold your diamond forever. At Shimansky we recognise these special moments and will be able to assist you in selecting your very own perfect platinum diamond engagement ring. As pure as your love to each other, platinum is the perfect choice for your engagement ring that will last a lifetime and beyond. While Shimansky offers a wide selection of exclusive designs crafted to perfection, we welcome your personal touch in designing your ring. You can have a special message engraved inside your platinum engagement ring and even write your names on the girdle of the diamond. We will be privileged and delighted to help you in selecting your most important ring in your life. The engagement ring is a ring designed and made to last forever, allowing you to wear the ring every day while maintaining its beautiful look and keeping the diamond safe. It is however recommended to have your engagement ring checked by your jeweller twice a year. Platinum is known as the most noble metal for jewellery with special properties that make this beautiful precious metal the best choice for engagement rings. Platinum engagement rings will not tarnish and will keep its white colour forever as platinum does not require plating, like white gold. Most engagement rings are made from a platinum alloy that consists of 95% platinum with 5% ruthenium -both are from the platinum metal group and are hypoallergenic. South Africa holds the world’s largest platinum reserve up to 80% of the entire world, it is one of the densest metals. All the platinum mined to date can fit in an average swimming pool, making platinum a very precious metal. You may pay a slightly higher price when choosing platinum for your engagement ring but over time you will get more value out of it as you will not need to re-plate your ring or undergo as much special maintenance as you would need to with white gold. Your platinum engagement ring will nor wear thinner with time and will hold your diamond with both strength and gentleness at the same time. When choosing your platinum engagement ring, make sure your finger size is measured properly as we always advise to have the ring made to fit rather than resizing your engagement ring later. As Platinum is by nature a more dense metal than gold, on average your platinum engagement ring will weigh around 1.4-1.5 times more that the same ring in 18K gold. It is highly recommended that for your Platinum engagement ring you also choose a platinum wedding ring, as a different metal and different alloy will not pair well together and the gold ring will wear away with time. Matching platinum rings together is better. Our engagement ring specialist will be happy to advise you on the best style of ring to suite your taste and budget while maintaining the highest standard in making your platinum engagement ring as beautiful as you deserve. When Shimansky created the Millennium Diamond Ring, Platinum was the obvious first choice, making the Millennium diamond ring the most sought after engagement ring in South Africa. It was no surprise when Shimansky introduced the My Girl Diamond to the world that the first ring was a Platinum My Girl Engagement Ring showcasing the solitaire diamond at its best. All Platinum engagement rings are hallmarked with the marking of PLAT950 and the SHIMANSKY mark assuring you that the best platinum is used as anything less than the finest quality will not deliver the same benefits that make your Platinum engagement ring so special and everlasting. The most popular engagement ring is the classic solitaire using 4 or 6 claws to hold your diamond. Feel free to contact us by email with any question you may have and you can always visit any of our stores and speak to our engagement ring specialist. At Shimansky you will be able to be select your dream ring from a wide variety of Platinum engagement rings that will be with you for the rest of your life, becoming a symbol of forever. 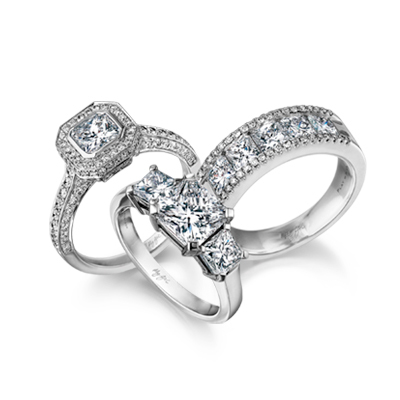 Shimansky is devoted to creating the best engagement rings in South Africa.